ARANZ Geo, Serko, Shotover Camera Systems and Xero vie for PwC Hi-Tech Company of the Year. Wayne Norrie, chair of the NZ Hi-Tech Trust, highlights the high calibre of nominations this year. “This year’s finalists span the full spectrum of the hi-tech sector with a record number of new companies entering for the first time," says Wayne Norrie, Chair of the Hi-Tech Trust. "There has been a huge number of entries across the board and it’s awesome the level of entries in the start-up and young achiever categories has been so high. “The New Zealand technology sector is clearly in great shape for the future with so many dynamic young companies embarking on their big journey. There has been a huge number of entries across the board and it’s awesome the level of entries in the start-up and young achiever categories has been so high. The calibre of entries have also reached a new milestone, he states. This has been reflected by the judges with several of them commenting that the quality of the entrants is at an all-time high this year. As a result the next phase of judging is likely to prove a challenge as the judges select the winners from such a strong pool of finalists. This year’s international judges include renowned American business strategist, Gary Hamel; co-founder of Apple, Steve Wozniak; founder of Massive, Claudia Batten; Director of Engineering for Google in New York, Craig Nevill-Manning; Senior Vice President for Cisco, Howard Charney; Andy Lark; CMO of Xero and Managing Director for IDG Ventures, Pat Kenealy. A local judging panel of more than 40 joins the international judges, including some of New Zealand’s most successful technologists and entrepreneurs. “We are truly thankful to all our judges, both here and around the world, who give up their personal time to assist us with judging," Norrie adds. 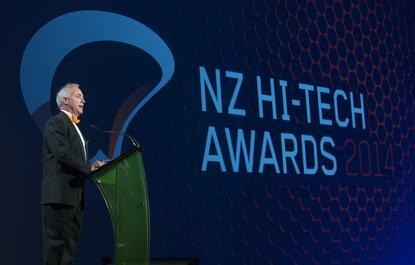 "The Hi-Tech Awards continues to be New Zealand’s most important industry celebration of success and a wonderful showcase for our technology innovation and talent." Winners in each category will be announced at a black-tie gala dinner at the TSB Arena in Wellington on 15th May 2015.